The following is the first in a series of art-flash fiction collaborative pieces that I will be doing with the talented Tara Larsen Chang. This lovely thing made it’s debut last night at the Krab Jab Studio‘s DIVINITY show. 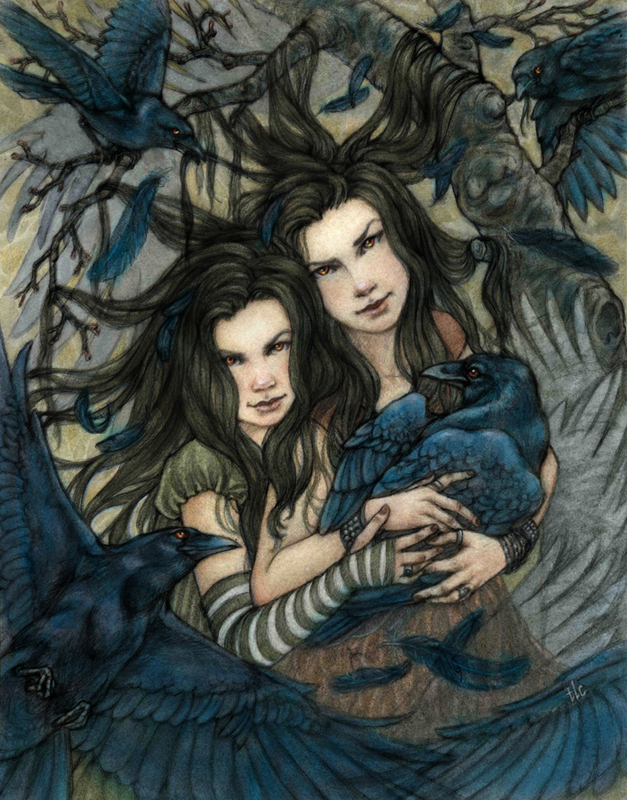 One for sorrow, two for mirth… The Sisters count the crows and they know all you have done. The birds gather the secrets up with the bugs and the berries and the carrion flesh, delivering them to the Moncler outlet girls who live beyond the trees and deep in the thicket. Hair bramble-combed, garments moth-knitted, they stroke midnight feathers and divine your future. Their knowledge comes with a price. No two prices are ever the same. Leave your silver and gold behind; mere coin cannot buy your future.